The first short track of the year rolls around this weekend with a NASCAR doubleheader at Martinsville Speedway. 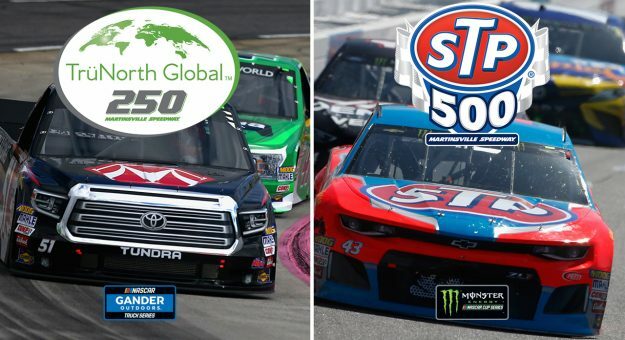 The historic .526-mile Virginia short track will host both the Monster Energy NASCAR Cup Series and Gander Outdoors Truck Series over the weekend. Sunday’s STP 500 (MRN, 1 p.m. ET) for the Cup Series is the sixth race of the season. Kyle Busch comes into the weekend on the strength of back-to-back wins at ISM Raceway in Phoenix and Auto Club Speedway to wrap up a very successful West Coast swing. Busch is entered in both races this weekend and is looking for NASCAR national series wins 201 and 202. Busch’s competition will be strong, including from inside his Joe Gibbs Racing stable. Teammate Denny Hamlin is a five-time Martinsville winner. The Virginia native has 26 starts at his home state track with 13 top-fives, 19 top 10s and an impressive 9.8 average finish. He’s led laps in 17 of the last 19 Martinsville races – highlighted by a performance in 2009 that saw him lead 502 laps in the two races – 296 laps in this spring race and 206 laps in the fall. The Daytona 500 winner would love to put win number six at the track on the board Sunday but is not bringing any extra pressure to the situation. The Martinsville schedule has Cup qualifying on Saturday afternoon following the Truck Series race this weekend. Saturday’s TrüNorth Global 250 (MRN, 1:30 p.m. ET) has the Gander Outdoors Truck Series returning to action after a two week layoff. Grant Enfinger comes into the weekend with a six point lead in the standings over Harrison Burton after three races in 2019. Kyle Busch will be wheeling a KBM Toyota in Saturday’s race that will also see veteran Johnny Sauter seeking Martinsville career win number five. The veteran driver, who returned to ThorSport Racing this year, has made 22 starts at the track with nine top five and 12 top-10 finishes, with an average start of 9.1 and an average finish of 12.0. Another multiple Martinsville race winner will be in Saturday’s race. Bubba Wallace will be driving the No. 22 AM Racing Chevrolet Silverado entry. Overall, Wallace has two wins in four starts at Martinsville, and tallied top-five finishes in each race. His “worst” finish was a fifth-place effort in his first visit to the track in the spring of 2013.